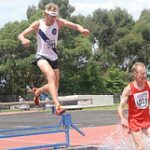 Melbourne University Athletics Club had a successful day at Athletics Victoria’s Shield Final with two top 5 finishes for the White Train’s Division 1 teams in the statewide track and field competition at Knox Athletics Track on Saturday, 12th of February. A strong team effort saw MUAC’s Division 1 Women claim fourth place and finish only 25 points from second place, whilst the Division 1 Men took fifth place. 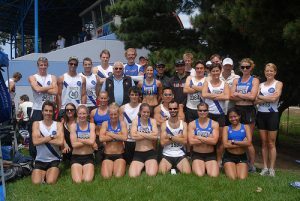 As one of only four clubs in Victoria to qualify for the Shield Final in Division 1 for both Men and Women, the result confirmed MUAC’s status as one of Victoria’s premier athletics clubs. The White Train’s focus for the day was team spirit and it was on prominent display as athletes gave their all for the club. Matt Irons took to the track in fine style in the 2000m walk, one of his less favoured events, to claim points for the club and backed up with some impressive javelin throwing and a strong 400m. Jarrod Pageot showed he’s on the road to recovery, joining in the javelin throwing fun, and MUAC’s top decathlete, Aaron Page, showed the versatility and endurance his sport requires ticking off six events over the day. MUAC athletes performed impressively against the state’s best athletes. Irie Hill won the Division 1 pole vault with a jump of 3.40m. Jo Bromfield continued her strong season to win the triple jump, with a 11.83m effort. Katherine Scarlett notched up her second national qualifier in the 3000m steeplechase in as many weeks, claiming the Division 1 race with a time of 12:04.3. Kath Clarke took second place in the Division 1 400m running 57.95 and took third in the 4x100m relay with Rachel Painter, Carmen Deane and Emma Doyle, in a time of 50.09. 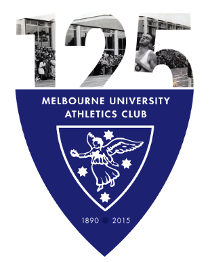 There is no rest for MUAC athletes as they will be back in action this Thursday, competing on their home track for the Victorian Mile Championship, and in three weeks at the Victorian Open Track and Field Championships at Olympic Park.